Like reishi and turkey tails, the maitake mushroom has been used for many years as a powerful medicinal. Although known in Japan, it only started gaining attention in the United States in the last 20 years. Yet unlike its other polypore cousins, maitake is edible and tasty! Let's examine Grifola frondosa in more detail. I'll start with some basic facts and talk about how to eat it. Then we'll move on to its medical reputation and end with some things to keep in mind when using supplements. Share a maitake story here! The name maitake means "dancing mushroom" in Japanese. It is also known as the "hen of the woods", "sheep's head", "king of mushrooms" (due to its large size), and "cloud mushroom". The Latin name is Grifola frondosa, referring to the mythical griffin. The maitake mushroom is a polypore. This means they have no gills on their undersides and release spores through small pores. Grifola frondosa is mainly found at the base of oak trees but will appear under other trees such as maple or elm. They are most common in the Northeastern areas of the United States and Canada. They also exist in hardwood forests in parts of Japan, China, and Europe. Remember where you find maitake mushrooms! They often appear in the same place each year. Maitake mushrooms fruit later in the season. Usually from early September to late October. It is characterized by its layers of caps that are curved like spoons. These layers sprout from a large fist-sized, tuber-like structure located underground. The brain-like folds of caps can grow fairly large. The entire fruit body can be a few feet across and can weigh as much as 40 or 50 pounds (around 18 to 23 kg)! Specimens as large as 100 lbs are said to exist. The caps start out darker when young and fade to a lighter gray or yellow. The edges of the caps often remain a darker color. Most mycologists consider maitake to be a saprotroph. Others classify it as a parasite so this matter is up for debate! Note that people often confuse the hen of the woods (maitake) with the chicken of the woods, which is a completely different mushroom. You may not suspect it at first glance but maitake mushrooms are edible. Many people consider them quite delicious with a strong flavor. Others find it can upset their stomach so try a small amount before you make a meal out of it. If you're not cultivating the hen and can't find it at your grocery store then it's time to hit the outdoors! Start looking at the base of oak trees near residential areas and at the edge of the woods. As always, make sure you check with someone knowledgeable if you're not absolutely sure of the mushroom you've found. Since the stem is very tough only slice off the caps for cooking. They should be young and firm, not dry, old, or mushy like the picture to the left. Make sure you wipe them down, wash them, and dry them before eating. The base of a tree is not the most hygienic place! Once you have clean maitake mushroom caps there's no limit to how you can cook them! They can be stir fried, baked, sautéed, stuffed, or made into a tea. One of the most popular recipes is to simply fry them in oil or butter until crisp. 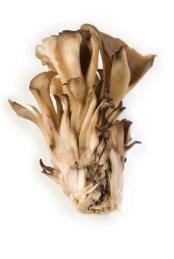 Maitake can replace button mushrooms in any recipe for a more flavorful result. Many people also freeze them before cooking. The mushrooms freeze well so don't hesitate to do this if you want to save some for later. The frozen caps will get you through the winter until morel hunting season! An extract of these helpful glucans was patented and is known as the maitake D-fraction. You'll see this term all over the internet when searching for maitake mushroom supplements. The terms "D-fraction" and "MD-fraction" are simply referring to a concentration of maitake polysaccharides. So what do these D and MD-fractions do? Research has shown them to regress tumors, especially in breast, liver, and lung cancer. A summary of one such study can be found here. This is just a citation, not an in-depth paper, but it notes improvement in human cancer patients after using the MD-fraction. You can start supplementing with maitake by either purchasing an extract of the D or MD fraction or with powdered capsules of the whole mushroom. Doses range from 1 to 3 grams per day, up to 7 for those fighting disease (check with a health practitioner before taking a high dose). Have you benefited from maitake? Please contact me, I'd love to hear your story! My personal recommendations are the Host Defense brand (more expensive but organic, made by famed mycologist Paul Stamets' company), or the Nature's Way brand (a maitake/shiitake blend, cheaper). As with all supplements, talk to your doctor before starting something new. Maitake's effects are cumulative. You probably won't notice anything after using it just once or sporadically. Take it every day and be patient. It can take a few weeks to 2 months to notice an effect. Unlike reishi, maitake doesn't seem to have the same anti-inflammatory action. Thus those with autoimmune diseases and women who are pregnant should not take it. Take all pills, powders, and teas with some vitamin C. Research shows that vitamin C increases the absorption of polysaccharides in the body. So add an orange or a multivitamin to your maitake routine! Try to buy organically grown mushrooms only. They are safer and better for you. Be aware of companies that make outrageous claims. Statements like "magic pill", "cancer cure", and "reverse aging" are simply not true. Maitake mushroom research is still young here in the West! Hopefully future studies will reveal more about its medical potential. What Are Your Uses for the Maitake Mushroom? Do you find them in the woods and have them for dinner? Have maitake mushrooms improved your health? Share your experiences here! 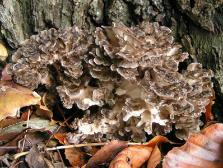 Click on the links below to see some great maitake mushroom posts. They were all written by other visitors to this page. How Do I Clean Maitake Mushrooms? We found them on our property for the first time this year, and are wondering what is the best way to clean them?